Well, I did say that many of the posts this week would be about food, but they're not all about delicious baked goods. Today I'm sharing with you a photograph I recently captured for the Chico Enterprise-Record column Sweet Basil & the Bee. The article is about winter treats, or holiday eats, or something like that. 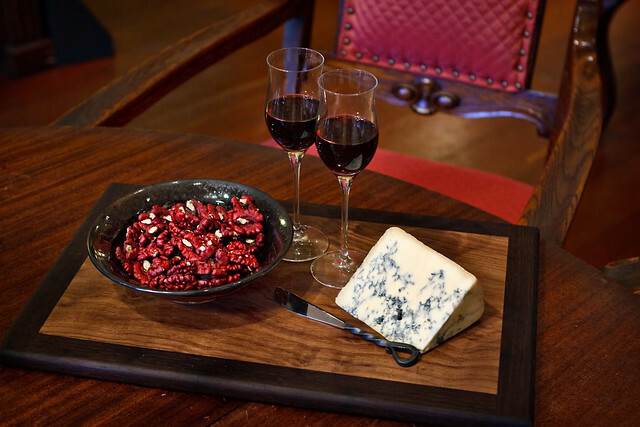 And some of those edibles happen to be red walnuts, English Stilton, and port. Port is a dessert wine that originated in Portugal but is now made all over the world. I won't share with you cool, quirky facts about this fortified wine because I simply don't know them. What I do know is that port brings to mind scenes of men's clubs, smoking jackets, and expensive cigars. And it's also perfect with Livermore red walnuts (which are harvested early Winter) and English Stilton, usually drunk at Christmastime with fortified wine. Enjoy! You can now buy Red Walnuts at Safeway and Vons. Their grown buy a local (Linden, CA) grower and packaged in their label in a 7oz clam-shell. Their sold in the fresh produce department. Their website is www.red-walnuts.com These Red Walnuts are delicious and look great in holiday recipes and as snacks.